Burrs grow on many weeds, bushes and trees, such as goosegrass, ragweed and stickseed, and are most commonly found in the northern hemisphere. 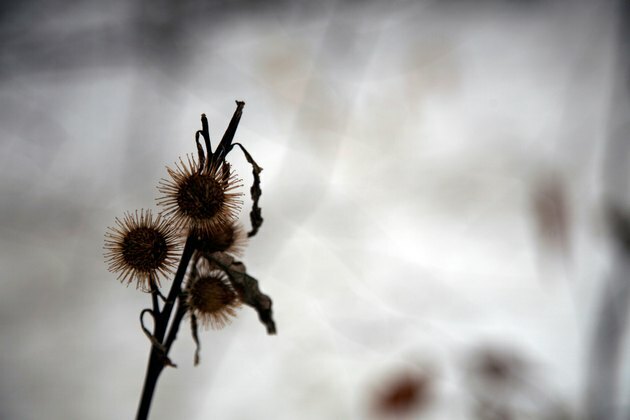 Burrs produce many tiny bristles that easily attach to clothing when they come into contact with it, especially soft flannel and cotton garments. The sharp bristles can be painful to grab and dig out, and their strong grip on the fibers of clothing makes removing them a very time-consuming process. Wash the clothes as you would a regular load of laundry and dry them in the dryer or on a clothesline. This softens the burrs and weakens the grip they have on your clothes. Place each article of clothing on a clean, flat surface. Slide the teeth of a plastic fine-tooth comb as far as you can beneath the burr and flick upward. This will remove most, if not all, of each burr's bristles. Tear a piece of duct tape from the roll and wrap it snugly around your hand, taping the ends together with the sticky side facing out. Dab the duct tape across the area the burrs previously covered as if you're using a cloth to blot a stain or liquid spill. This will grab any of the last remaining burr bristles still stuck in the clothing. Turn each article of clothing inside out and dab the duct tape on the opposite side of the affected area. Burr bristles can sometimes embed themselves so deeply into clothing fibers, they come through the clothes to the other side and may itch and irritate skin. A plastic comb is firm enough to stand up to the strength of burr bristles but not sharp enough to damage your clothes like a metal comb. Avoid using duct tape to remove burr bristles from highly delicate types of clothing such as cashmere or nylon. Instead, use a magnifying glass to find and tweezers to individually remove each one.